European Destinations Available: Amsterdam, Athens, Barcelona, Berlin, Brussels, Budapest, Copenhagen, Dubrovnik, Dusseldorf, Edinburgh, Frankfurt, Geneva, Hamburg, London, Madrid, Manchester, Milan, Moscow, Munich, Paris, Prague, Rome, Venice, Vienna, Warsaw and Zurich. North American Destinations Available: New York, Las Vegas, Los Angeles, Newark, Dallas, Honolulu, Boston, Washington, San Francisco, Vancouver, New Orleans, Phoenix, Houston, Vancouver, Toronto, Miami and Chicago. Asian Destinations Available: Kuala Lumpur, Singapore, Hong Kong and Bangkok. Please Note: Strict routing restrictions apply that may require passengers to travel between the USA and Europe using only Milan/Athens and New York/Newark airport options. Where First Class seats are unavailable, Business Class options may need to be supplemented. An exceptional journey from start to finish. The Emirates story started in 1985 when they launched operations with just two aircraft. Today, Emirates flies the world’s biggest fleets of Airbus A380s and Boeing 777s, offering their customers the comforts of the latest and most efficient wide-body aircraft in the skies. Emirates aims to inspire travellers around the world with their growing network of worldwide destinations, industry leading inflight entertainment, regionally inspired cuisine and world-class service. Emirates has been recognised many times over the years for the quality of their inflight cuisine, the breadth of their inflight entertainment, and the excellence of their overall service. Emirates has been also awarded the Best First Class and Best Business Class. When it comes to the big, bold and beautiful, Dubai is in a class of its own. It's one of the seven states comprising the United Arab of Emirates. Sunshine all year around and a warm, cosmopolitan atmosphere is what characterises Dubai . From sports, fine dining and shopping to experiencing the magic and hospitality of Arabia, Dubai has it all. Lying on the sparkling blue waters of the Arabian Gulf , it is a perfect place for sailing, windsurfing and jet-skiing. The varied terrain also enables the thrilling experience of a desert safari. And that's not all! 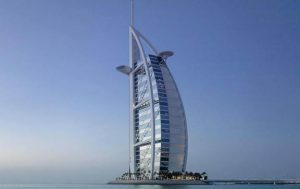 Dubai is also without doubt a shopper's paradise offering the age-old experience of shopping in a local souk or the ultra modern experience of a multi-level shopping mall. 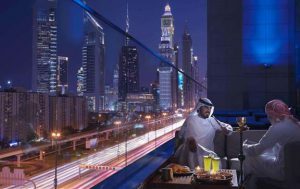 The cosmopolitan flavour of Dubai is reflected in the multitude of restaurants and entertainment spots, each with its own ambience. The nightlife is equally varied, with bars, pubs, discos and nightclubs open till late. Come and sample the unique flavour of one of the world's most popular destinations. 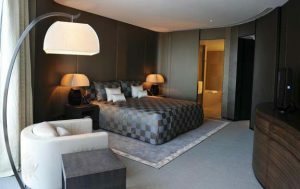 The luxurious Armani Hotel Dubai marks the official debut of world famous fashion designer Giorgio Armani in the world of hospitality. Acknowledged as the best hotel in the world, this legendary & symbolic 7 Star hotel has attracted international attention and awe. Swim with dolphins, relax on pristine beaches & dine under the sea at this award winning 5-star resort perfect for families. 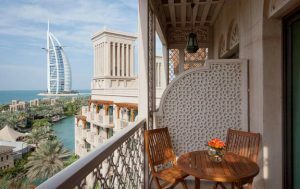 Elevated as if to emphasise its splendour, Al Qasr is the 'palace' at the heart of Madinat Jumeirah, The Arabian Resort - Dubai. Al Maha Desert Resort & Spa is an idyllic, exclusive oasis, set within a 225-square-kilometre desert conservation reserve - a place where a commitment to service and total guest satisfaction is underlined by a ratio of three staff to every one of the sumptuous guest suites- ensuring attentive and personalised service 24-hours a day. 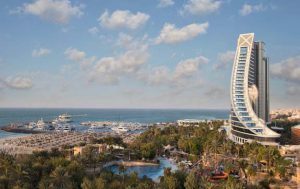 Vibrant and luxurious, Jumeirah Beach Hotel is Dubai's premier lifestyle destination, and has given itself completely to the pleasures of the life, and the senses of every guest who stays in the resort. 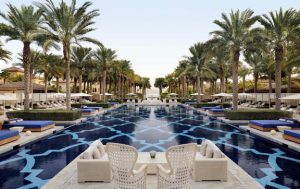 A unique blend of contemporary design and urban chic, The Fairmont Dubai is an icon in the business heart of the city. Nestled on a secluded peninsula on The Palm, the resort acts as a private enclave for guests to enjoy spectacular views of the city skyline. The Private Spa invites you unwind in nine individual Spa Suites with private outdoor patios. 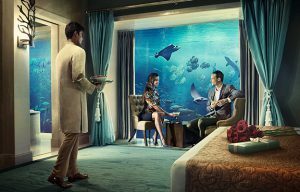 Note: If you are flying with Emirates and stop over in Dubai, discounted hotel rates may apply. Please contact our consultants for details. Book a transfer between Dubai hotel and airport or book limo transfer with our specialists. Book Dubai tours & sightseeing. Summers in Dubai are hot and humid, however all shopping malls, taxis and indoor facilities are fully air conditioned. Souks and other outdoor activities are best visited in the early morning or evenings, to avoid the midday sun. The most comfortable garments are those made of cotton or light cotton mix. Dress is generally informal, but hotel restaurants prefer smart casuals and visitors are expected to dress respectably. Town-shorts and T-shirts are acceptable in most establishments. Swimwear can be worn on the beach or by the pool. Arabic is the national language of the UAE. English, however, is widely spoken and understood. The majority of information signs are in both languages. 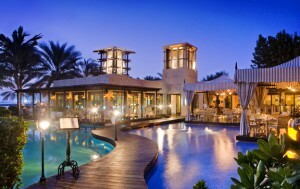 There is an astonishing variety of cuisine in the UAE and most hotels offer a selection of local specialties. Although the UAE is a Muslim country whose religion forbids the consumption of alcohol, the rule does not apply to persons of other religions. Consequently hotels have bars, nightclubs, discotheques and restaurants, where alcoholic beverages may be consumed - generally at reasonable prices. Restaurants outside hotels do not serve alcohol. This year Ramadan is predicted to start on 10th August and finish on 10th September. During Ramadan, Muslims commemorate the revelation of the first verses of the Holy Quran, abstain from food, drinking and smoking between sunrise and sunset, and then break their fast with family, with a traditional feast called iftar. Throughout Ramadan, hotels across Abu Dhabi host nightly, delicious iftar banquets for guests and non-guests. These highly social meals are the ideal opportunity for your clients to experience the tantalising array of exotic flavours that Abu Dhabi has on offer. Visitors to Abu Dhabi during Ramadan are expected to refrain from eating, drinking and smoking in public places during daylight hours. It is also worth noting that shops close from 1.00pm until after iftar, and then stay open until the early hours. Experience Emirates Airlines world-renowned First Service, including High Tea, hors d'oeuvres and cuisine. Relax in your Private Suite on selected aircraft, and enjoy the luxury of an in-flight Shower Spa on the Emirates A380. Retreat into your own world inside the Emirates First Class Private Suite. If you value privacy and personalised service above all else, you'll love the First Class Private Suites. Each suite comes fully equipped with a sliding door, a personal mini-bar, adjustable ambient lighting and its own vanity table, mirror, wardrobe and privacy divider for central suites. If you want to stretch out and sleep an Emirates Crew Member will convert your seat to a fully flat bed with a mattress, so you can arrive at your destination completely refreshed. First Class Private Suites are available on all Emirates A380 and Airbus A340-500 aircraft and most Boeing 777 aircraft. First Class cabins on other aircraft offer flat-bed seats or deeply-reclining comfort. Regionally inspired dishes and locally sourced ingredients are the kinds of touches you'll enjoy when you dine with onboard an Emirates flight in First Class. Experience cuisine and service worthy of the world's finest restaurants in Emirates First Class with a range of dishes, carefully selected and prepared, available on demand throughout your flight. Presented on Royal Doulton fine bone china with exclusive Robert Welch cutlery, alongside the finest wines in the air, every aspect of your dining experience has been tuned to perfection. Along with extras such as High Tea and hors d'ouevres in the Onboard Lounges, your journey will leave your appetites completely satisfied. Emirates Airlines understands that air travel can be tiring, especially during long flights. That's why they have included two onboard Shower Spas as part of the First Class experience on the Emirates A380. From the state-of-the-art shower system to the classic walnut and marble design to fine linens, the Shower Spas were conceived with your pleasure and convenience in mind. And, to complete the spa experience, Emirates offers their signature Timeless Spa shower kits, made from the finest natural ingredients. A relaxing visit to the Shower Spa can help ensure you arrive at your destination ready to take on the day. When you're ready for a snack, a beverage or casual conversation, our First Class and Business Class Onboard Lounges offer the perfect mid-flight diversions. Located on the upper deck, the two lounges offer a place for you to sample hors d'oeuvres and maybe a Grand Cru. Savour five-star delicacies prepared by some of the world's leading chefs, as well as fine wines carefully chosen by our sommeliers. You can even have your favourite cocktail prepared for you by our dedicated bartender. Whether you're socialising, snacking or simply stretching out, you can relax in the height of comfort in the Onboard Lounges. Emirates' impeccable service does not end at the door of the plane. The crew will go out of their way to make sure your entire journey is as smooth as possible. Along with complimentary Chauffer-drive service and lounge access, First Class and Business Class customers (as well as Emirates Skywards Platinum and Gold members) will also receive complimentary Fast Track vouchers are available at most airports around the world, to help speed you way through airport formalities. Stretch out, rest and relax. Arrive at your destination fully refreshed with our flat-bed seats. Enjoy lie-flat comfort on selected aircraft with Business Class seats that convert into a flat bed at the touch of a button. Using the touchscreen controller, you can adjust your seat to suit your own preferences and comfort. Each seat extends to form a flat bed up to 79 inches long. The flat-bed seats are tailored to the way you like to travel, with an in-seat power supply for laptops and an extra-large table providing a comfortable workspace. Relax with your large-screen personal entertainment system, along with the built-in mini-bar in every seat, personal storage area and privacy divider. Lie-flat Business Class seats are available on all Emirates A380 aircraft and most Boeing 777 aircraft. Business Class cabins on other aircraft offer deeply-reclining comfort or spacious sleeperettes. Meals should relax and restore as much as satisfy your appetite. That's why we offer great tasting, regionally inspired menus, including healthy options, all presented on Royal Doulton fine bone china with exclusive Robert Welch cutlery - providing Business Class dining that's unmatched. Enjoy multiple courses and complimentary champagne and vintage wines, along with other cocktails and beverages. Enjoy conversation, cocktails and hors d'oeuvres in the Emirates A380 Onboard Lounge. When you're ready for a snack, a beverage or casual conversation, the exclusive Onboard Lounge offers the perfect mid-flight diversion. Located behind the upper deck, the Onboard Lounge offers five-star delicacies prepared by some of the world's leading chefs. If you're looking for the perfect beverage, you can savour a fine wine carefully chosen by Emirates' sommeliers or even have your favourite cocktail prepared for you by our dedicated bartender. Whether you're socialising, snacking or simply stretching out, you can relax in the height of comfort in the Onboard Lounge. Movies , TV shows, games, music, news and more, all at your fingertips. A touchscreen remote and a state-of-the-art digital widescreen provide access to a whole world of entertainment. Whatever you're in the mood for, whether it's international movies and TV programmes or music, video games and news from around the globe - with up to 1,500 channels, the ice system will deliver on-demand entertainment when you want it. Emirates Airlines goes out of their way to make sure your entire journey is as smooth as possible. Along with the chauffeur drive service and lounge access, First Class and Business Class customers (as well as Emirates Skywards Platinum and Gold Members) will also receive complimentary Fast Track vouchers at check-in and before arrival. Fast Track vouchers are available at most airports around the world, to help speed your way through airport formalities. First Class and Business Class customers are permitted two pieces of carry-on baggage: one briefcase plus either one handbag or one garment bag. The briefcase may not exceed 18 x 14 x 8 inches (45 x 35 x 20cm); the handbag may not exceed 22 x 15 x 8 inches (55 x 38 x 20cm); the garment bag can be no more than 8 inches (20cm) thick when folded. The weight of each piece must not exceed 7kg (15lb). When you fly with Emirates to and from destinations outside the Americas, First Class customers are permitted 50kg of checked baggage allowances, whilst business class travelers are allowed 40kg. When you fly to and from destinations within Canada & the Americas both First & Business Class customers ar permitted up to 2 bags of 32kg each. If however, you have a stop over in Dubai of over 24 hours, then First Class Customers are permitted 50kg of checked baggage allowance & businesses class travelers are allowed 40kg, as above. For more information regarding Emirates' baggage allowance, please contact one of our Travel Specialists. Whether you need a few minutes to catch up on work or simply want to relax away from the crowds, you’ll find the Lounges in international airports across six continents, including Emirates' A380 hub in Dubai. When you’re leaving Dubai, prepare for the next stage of your journey with all your creature comforts close at hand. Our luxury lounges offer gourmet buffets, à la carte meals, and fresh juice bars. You can have your shoes shined or take some time for yourself with a soothing spa, massage or beauty treatment. Emirates First Class travelers can even sample and purchase exclusive vintage wines in a private wine cellar. As a First Class or Business Class traveller, or as an Emirates Skywards Platinum or Gold member, you’re invited to unwind in any of our worldwide Lounges across the globe. Savour our selection of carefully prepared fresh food and full bar service while you keep tabs on the latest news on large plasma screen TVs. Catch up on that last bit of business in our fully equipped Business Centres or simply freshen up with a shower and relax before your flight. Make the most of every moment on your journey when you fly First Class or Business Class. Book our complimentary Chauffeur-drive service, and we’ll take you to and from the airport so you can spend more time focusing on what drives you. We’ll collect you from your door and, when you land, we’ll be there to take you to your final destination. That could be straight to your hotel, your next meeting, your favourite restaurant or to the course for a round of golf. Enjoy our exclusive Chauffeur-drive service in over 70* cities worldwide - for more information or to book the complimentary Chauffer service, please contact one of our Travel Specialists.